Today, I thought I would post another reminiscence from my East Village performance days. But it’s not coming together. So, instead, I’m putting up this drawing. It’s from a book I wrote called Peter Pigeon of Snug Harbor. It was the thing I did after the Modern Venus series. Ostensibly it was a kid’s book, although I got the best response from people 80 or over. Somebody asked me whether this was a reaction to the Modern Venus (i.e. smutty) paintings. 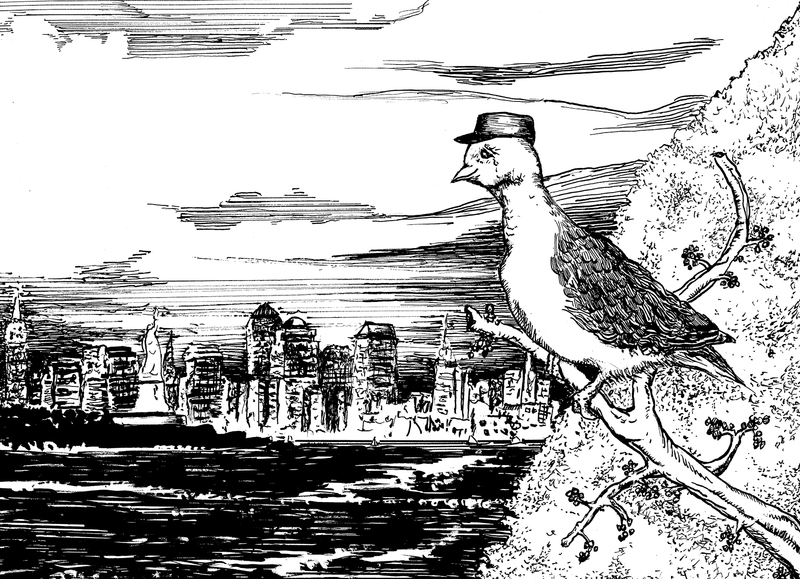 But actually it all started with a pigeon I met on the Staten Island Ferry. He was riding towards Manhattan, standing on the rear deck, staring back longingly at Staten Island. It was a sharp contrast to the other passengers who seemed more than happy to be looking in the other direction. I couldn’t help wondering what the pigeon’s story was. Then after seeing Snug Harbor for the first time, It came to me (what might have happened). I was still having problems with radial tunnel syndrome then — It’s like carpal tunnel, but it’s in the elbows — and I had some new voice software that I wanted to try out, so I went to work. It was never my ambition to write children’s books, but I guess it turned out pretty well, because in 2006 the story won a prize courtesy of JP Morgan/ Chase and Poets and Writers. When I went to do the drawings it was kind of strange, because even though I’d been painting, I hadn’t done any drawing since my college days. Black lines are a strange, magical, way to convey an image. It’s remarkable that their use has become so commonplace.